The supercritical (or subcritical) CO2 method uses carbon dioxide under high pressure and extremely low temperatures to isolate, preserve, and maintain the purity of the medicinal oil. The CO2 extraction process allows compounds to be extracted with low toxicity. When done well the end product is safe, potent, and free of chlorophyll. Alcohol has a high polarity and is water-soluble, making it one of the least-selective solvents. Using well-dried and well-cured cannabis can help decrease the amount of chlorophyll and moisture pulled from the material. Created by filling a vessel with cannabis, which is then soaked in alcohol and lightly agitated. The longer the mixture is agitated and steeped, the more cannabinoids are extracted—but so are chlorophyll, plant alkaloids and waxes. Depending on the starting material and the quality desired, the cannabis is soaked anywhere from a minute to a few hours, after which the solvent is strained. The remaining solvent is then evaporated leaving behind a powerful oil rich in THC. 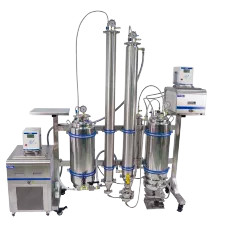 Is a refinement process which takes end product of an extraction process used and refines the oil once more through a fractioning process to produce a substance with a much higher cannabinoid purity.